Will Florence’s steak make the cut for UNESCO “intangible” status? If you’re a meatlover and you’ve been to Florence, chances are you’ve tasted its specialty steak. Revered by foodies from all over the globe, the Tuscan city’s succulent steak is now officially being promoted as a candidate for the UNESCO list of Intangible Cultural Heritage. A committee was recently formed to present the candidacy of the bistecca alla fiorentina, while an itinerary for its inclusion on the list was presented this month at the Food and Wine Biennial, in the presence of Florence’s Councillor for Economic Development, Cecilia Del Re. More than 350 traditions, art forms and practices have gained “intangible” status, from Spain’s flamenco dancing to Indonesian batik fabrics and the art of the Neapolitan pizzaiuolo. “Cultural heritage does not end at monuments and collections of objects,” UNESCO says on its website. But what makes the bistecca alla fiorentina a worthy candidate? The bistecca alla fiorentina is a large, bone-in cut of beef that is grilled from room temperature for three to five minutes on each side over scorching hot coals. The steak is ready when it is charred on the outside and very rare on the inside. It is sliced and served family style, sauced only by its own flavoursome juice and seasoned with a pinch of salt. The thickly cut steak is a symbol of a culinary tradition that uses few ingredients of exceptional quality, prepared and served simply. Normally measuring around four centimetres in height and weighing up to two kilograms, the cut is traditionally taken from Chianina cattle: a large, white Tuscan breed with a pronounced neck hump. It is obtained from the loin of the young steer and has a T-bone with the fillet on one side and the sirloin on the other. Not only a tantalising dish, the bistecca alla fiorentina is also a delicacy as ancient as the city it is named after. According to historians, the name bistecca comes from the British term “beef steak” and its history in Florence dates back to the 16th century, when the Tuscan capital was under the reign of the Medici family. During that time, Florence was a major crossroads for travellers from all over the world. On August 10, Florentines come together for the famous Festa di San Lorenzo, a celebration which has taken place for centuries. During the festivities under the Medici family’s rule, large pieces of juicy meat were served up. From that moment on, locals apparently began calling the iconic cut of meat bistecca, adding an Italian touch to what they had heard from the Englishmen. 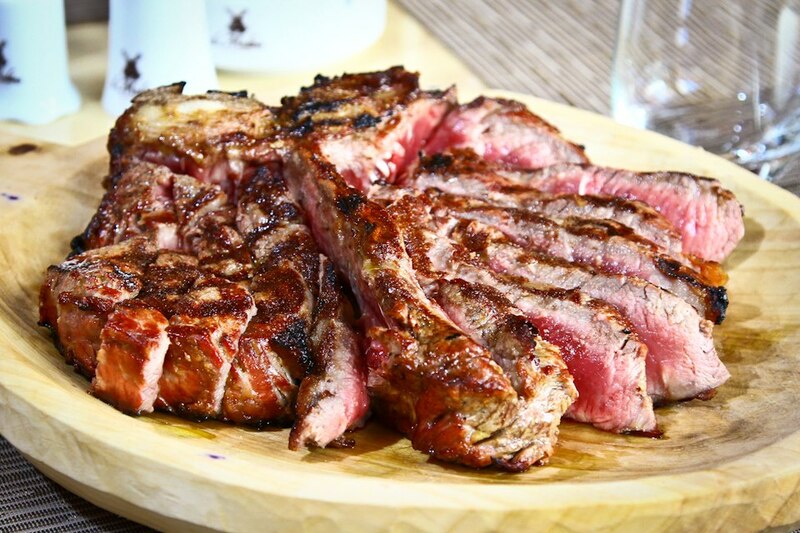 Both the rich history and unique preparation and cooking of the bistecca alla fiorentina give this dish a good chance of obtaining “intangible” status. Fingers crossed for Florence its famous steak makes the cut! Applications close on March 31, 2019, for consideration for the 2020 UNESCO list of Intangible Cultural Heritage.